Decorative Life: From 14-21 days, longer with supplemental light under interior conditions. Harvest when at least 50-75% of the flowers are open as subsequent flower opening under interior conditions is often minimal. Low light levels during production and high growing mix pH can lead to reduced flower color development. The use of growth retardants to shorten the plants during production is necessary with B-Nine working well. However, the effectiveness of growth retardants is cultivar specific with white flowered cultivars often not responding as well as pink 0r blue ones. Member of the Gentianaceae (gentian family). Native to the Great Plains of North America, mainly Texas. 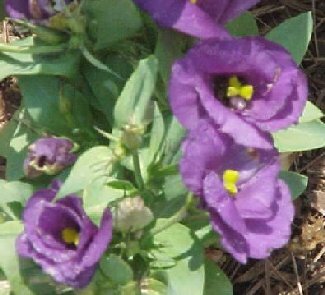 Relatives include gentian and exacum or Persian violet. Flowers cupped or tulip-like, about 2 inches in diameter and up to 3 inches long, occur at ends of small branches. After treatment with a growth retardant, stems are generally from 8-16 inches long with leaves and many small branches with flowers at many stages. Plant is a perennial planted as an annual. Data not reported but assume 34-38F for as short a period as possible. Cultivars with single flowers include ‘Heidi’, ‘Yodel’, ‘Flamenco’. Double-flowered cultivars are ‘Double Eagle’, ‘Echo’ and ‘Mariachi’. The specific epithet name “grandiflorum” means large flowers. From the Greek “eu” (good) and “stoma” (mouth), referring to the beautiful corolla (petal) throat. Some favorite cultivars and their respective flower colors include ‘Lisa’ (blue, lavender, pink, white). This species is geotropic and will bend up if stems are placed horizontally.